The 2017 NCAA Division III Championships are quickly approaching. The meet will take place in Shenandoah, Texas from March 15-18. The official psych sheet can be found here. Arce burst onto the NCAA scene last year as a freshman by winning the 500 free on night one of competition. She took the event in 4:48.52, just over three seconds faster than her seed time of 4:51.74. This year, Arce comes in as the top seed with a 4:51.47, so she has once again put herself in contention of winning this race. She should have some legitimate competition but expect her to be ready to take this one. A junior, Zanolli comes in as the third seed at 4:51.95. Two factors make Zanolli the top wildcard here. First, she achieved her time in December, like competitors Angela Newlon and Campbell Costley. But she was able to post a 4:56.71 at UAAs, which stands clearly as an unrested swim. The second piece to her puzzle is her consistent move up the ranks throughout the years. As a freshman, she made the meet in this event and swam a 5:03.34 for fourteenth. Last year, she raced a 4:53.27 at UAAs and took thirteenth at NCAAs. She is steadily on the rise and could be a serious contender in this event for the next two years. And a team like Wash U. has been known for breakout national titles in the past, so do not count out Nicole Zanolli. As a freshman, Daher went into NCAAs with the third seed in the 200 IM; this year, she will head into the meet in the same position. She ended up finishing sixth, following up her performance with eighth and second place finishes the next two years. As the reigning runner-up in this event, Daher has the experience needed for an NCAA championship final. Daher will be looking to carry on the NESCAC tradition of excellence in this event. With last year’s champion Emily Hyde graduated and Williams’ Emma Waddell choosing the 50 free, the stars are aligning for Daher to have her breakout moment at the NCAA level. Her seed time of 2:03.02 is faster than it has ever been, so despite not being one of the top two seeds, Daher could take it all this year. The one person who may stand in her way is Emory senior Annelise Kowalsky– who happened to be the second seed their freshman year headed into NCAA competition. She also took second that year, and has placed fifth and sixth, respectively since then. This year Kowalsky will be the fourth seed headed into the meet, but you can never count out an Emory Eagle. With their dominant team performance, the atmosphere and hype alone could surge Kowalsky to the win. Her seed of 2:03.38 is just seven one-hundredths slower than her seed time her freshman year, so she appears to be back and ready to go. Despite being the second seed, Paulson is the defending National Champion in the 50 free. She came in as the top seed as a sophomore, but finished fifth overall. Last year, she won the event in 22.77, just .06 off the NCAA Division III record set in 2009 by Kenyon’s Elizabeth Carlton. She has gone 23.02 so far this year, which is just where she should be if she wants to claim this event again. Paulson is known to swim a bit under the radar during the season and make the most of every opportunity when it matters. She could scare the NCAA record here and should repeat as the National Champion. Waddell, just a junior, is the only swimmer to break the 23-second barrier so far this season. The main reason why she may fall just short of Paulson is that the time is from a time-trial at NESCACs. Waddell, who is a stranger to losing races, may not have the experience that Paulson does of racing in a fast 50 free final. While she has plenty of race experience and fast swimming under her belt, this will be her first 50 free final at NCAAs as she has swam the 200 IM the last two years. But nonetheless, it is clear that Waddell has been on the fast track to success this season. Do not count her out as she will be determined to claim her first individual NCAA title in this event to go with her 2015 title in the 100 butterfly. Pierce is no stranger to the 400 IM championship final at NCAAs. After claiming the event as a freshman, she earned runner-up honors as a sophomore and won back her title last year as a junior. This year, Pierce will come in with the top seed and a lifetime best time of 4:17.02 from the recent NESCAC Championships. You cannot think Division III 400 IM over the last four years and not think of Pierce. She has earned the crown twice here, and should pick up the event for the third time in Shenandoah. There will be many challengers in this event, as there is obviously a lot of time for someone to make a move. Of these women, the best chance of an upset looks like it would be from the efforts of Durmer. A sophomore transfer from the University of Virginia, Durmer comes into the meet with a 4:20.26. However, her best is 4:19.86 from last year’s ECACs, and this time would have been good enough to win last year. You just do not know what it will take to win the 400 IM. Last year, Pierce also came in with a 4:17, but it only took a 4:20 to win. Where there is room to make a move, there is also room to make a mistake. Durmer is an all-around distance swimmer and will have the back half to chase down Pierce. This could definitely shape up to be one of the women’s races to watch in Shenandoah. After qualifying second in prelims last year, Waddell was denied the opportunity to defend her national title in this event after getting disqualified in the final. There is no doubt that she will be back for revenge in this race, hoping to claim the top spot once again. In 2015, she took the event in 53.65. She then swam a 53.37 at the 2016 NESCACs. This year, she has posted a 54.14, which is a bit off her best but still good enough for the top seed. She will have a range of challengers from veterans to rookies. But it is pretty much guaranteed that few swimmers in this final will have the motivation Waddell does. Kane comes in with the second seed in this event at 54.67. She set this mark, a best by almost a second, in December. She raced to a 55.63 at NCACs, which is faster than how she swam at the meet last year. She has placed sixth in this event for the last two years, so she will be longing for a trip higher up the podium. Kane has the experience; all she needs now is the speed to out-swim to Waddell and a series of others. Cheng will be coming in to the meet with the top seed in this event at 1:48.13 from December’s Miami Invitational. She has been dominant all season long in her races, and this should be no different. She has placed sixth in this event at the last two NCAA Championships, but should have a true breakout meet in Texas. Likely to come off a victory in the 200 medley relay the night before, Cheng should have the relaxed confidence of being able to win the 200 free. While she will still be relatively fresh, this will not be her first final of the meet, so she should settle in well. Kenyon’s sophomore standout Orbach-Mandel has also been having an impressive season. She posted a 1:48.71 at NCACs and will be the challenger to watch in the 200 free. She finished fifth in this event last year, but with a much slower time above 1:50. It took a 1:48.88 to win this event in 2016, but it looks like at least two women will be under that this time around. Defending National Champion Julia Wawer (1:51.37) of Emory and third-seed Abby Wilson (1:49.00) of Kenyon will also be in the mix, so you can expect this race to be much faster than last year. If one of these women wants to claim the 2017 200 freestyle national title, it is going to take more than a 1:48.88. Garza comes in as the top seed in this event after two All-American finishes the last two years. Her seed time of 2:01.81 is the fastest she has ever gone pre-NCAA, and is just off her best of 2:01.09 from 2015. Four of the six swimmers who beat her last year will not be returning, giving her just the opening she may need to take the win. 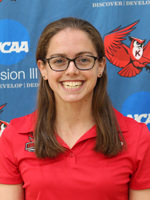 Along with two years of experience and the confidence from defending her NCAC crown in this event, you can expect Garza to take her moment for the Big Red. This could be the start Denison will need for the night, and Garza has the chance to do it for them. Despite being a freshman, Dasow truly made a name for herself at the PAC Championships a few weeks ago. In 2014, Dasow swam a 2:05.00 in this event at NCSA Juniors. The following year, she swam a 2:09.40 in the event, but posted a 2:05.18 for Grove City in December. Just two months later, she blasted a 2:01.91 to take the third-fastest time in the nation so far this year. Being a freshman makes her a wildcard in itself, as it is really unknown how she will handle the pressure of a double taper, a close race, and an NCAA championship final. So if there is anyone who has earned wild card status in this event, it is 100 percent Anne Dasow. Cheng is the only swimmer so far this season to break the 55-second barrier. Two women were under at NCAAs last season, including defending National Champion Emma Paulson who took the event in 54.43. Cheng’s entry time of 54.86 is just off this. Cheng has routinely posted sub-55 100 backstrokes leading off the 400 medley relay, but will need to put it together on her own if she wants to win the 100 back title. She has simply been dominant in this race all year long, and is coming in a full second faster than she was last year. You can never count out Paulson at the NCAA Division III Championships. For reference, she took third in this event as a sophomore and won it as a junior. The difference for this year is that she has not gone a 54 yet, as she has in the past to years before NCAAs. This is the only true indicator of why she may not have the backstroke speed so far this year to beat out Cheng for the win. Regardless, she holds the second seed and should definitely be one of the top two finishers. Let’s start here: the last time Senczyszyn lost a 100 breaststroke was December of 2013. The meet was Speedo Winter Junior Nationals where one of the three people to beat her was none other than America Record holder Lilly King. By no means does this mean she will go unchallenged– Kt Kustritz of Denison, Julia Wilson of Kenyon and Caroline White of Williams will not give her an easy victory. But if anyone was going to break the NCAA record this time around it’s Senczyszyn. Her best of 1:00.90 from last year’s WIACCs is .46 off the mark set in 2006 by Williams’ Lindsay Payne. She opted out of the event this year on the conference level, but with a year of NCAA experience under her belt she should defend her national title in this event. Out of all the challengers for Senczyszyn, on paper it appears that Kustritz will have the best chance at running her down. She swam a 1:01.46 in December and has been having an incredible freshman season. The 100 is definitely her better race over the 200 breaststroke, and she has handled pressure situations well all season. She won the event in an early dual meet against Ohio State and also took the win at the Miami Invitational against Division-I swimmers from Miami-Ohio, Bowling Green, Indiana and more. She just does not seem like a freshman that will crack under the pressure of NCAAs. Arce is also the defending National Champion in the 1,650, where she won by over six seconds with a final time of 16:33.29. This year, she was just off her NCAC time from last year, so she comes in about three seconds slower. She still holds the top seed and should be able to handle this race with ease. Stanley had a breakthrough swim at CCIWs posting a 16:48.04 for the third seed. She placed eleventh in this event last year but that was without breaking 17:00. This will be the last swim of Stanley’s career, so you never know what you will see when a senior sets out on this endeavor. If Arce swims the race she is capable of it may be just out of Stanley’s reach, but Stanley will earn her first All-America title in this event with this race, and could definitely place in the top two if she repeats her performance from a few weeks ago. Waddell will be looking to cap off her meet with a victory in the 100 freestyle. The top seed at 49.87, Waddell will be looking to improve upon her third-place finish from last season. With champion Hannah Lobb of Kenyon graduated, this leaves an opening in this event. The recent NESCAC Championships was the first time Waddell broke 50 seconds, which will set her up well to be a contender here as it took a 49.90 to win last year. She was a 50.35 headed into last years meet before racing to a 50.06 in the final. So if history repeats itself, expect Waddell to be just a fit faster in March and get her hand on the wall first. The only thing standing in Waddell’s way in this one is Emory’s Muir. She beat Waddell last season when she placed second with a 50.02 in the final. Muir holds the second seed at 50.00 from December. This indicates that there is probably a lot more left in the tank for Muir since she posted a 50.21 at UAAs (likely an un-rested swim). Just a sophomore, Muir will be looking to make an impact on this event now and for years to come. Jackson will be looking to re-claim her national title in her signature event this year. As a sophomore, she won with a 1:57.24. Last season, she took runner up honors to Emma Paulson with a 1:57.44. As a senior, she is the currently the second seed with a 1:58.44, a tenth faster than her seed time from two years ago. Last year, she came in at a 2:00.11 (on the slower side of the Olivia Jackson scale), so it appears that she is setting herself up to regain her title as the 200 backstroke National Champion. Despite Jackson’s experience, Cheng holds the top seed at 1:57.26. Again, this is not out of Jackson’s range, but Cheng’s performance in this event is a bit unpredictable. She finished tenth as a freshman, but fell to a disappointing twenty-third last year. This was surprising after she posted two All-American swims and was a member of two winning relay teams in the days prior. It would be wrong to speculate what happened in this race, but Cheng could be ready to go here now with two years of experience at this meet. It is pretty hard to best against the NCAA Division III record holder in any given event. This is the case with Senczyszyn, who took hold of the mark in a 2:12.20 from the WIACC Championships last year. She ultimately ended up second at last year’s NCAAs to Amherst’s Emily Hyde, but Hyde’s efforts were just not enough for the NCAA Division III record. Senczyszyn posted a 2:14.22 in December, which is about half a second faster than her swim from the previous year. While White may not have the speed to take over the 100 breaststroke, watch out for her in the longer distance. She will head into the meet with the second seed of 2:14.53 from the NESCAC Championships a few weeks ago. She was very much unchallenged in this race, where she won by over four full seconds. It will be interesting to see what she can pull out while chasing Senczyszyn, or maybe even pulling ahead of her.